From acrostics and riddles to kennings and paradiddles, this is a fun anthology of puzzling poems which also encourages children to have a go at writing poetry themselves. I am a Jigsaw is an excellent tool for teachers who want to introduce different forms of poems to their pupi... read full description below. 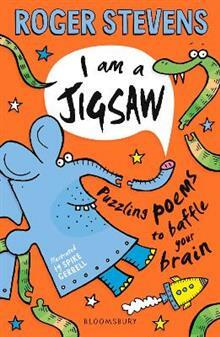 From acrostics and riddles to kennings and paradiddles, this is a fun anthology of puzzling poems which also encourages children to have a go at writing poetry themselves. I am a Jigsaw is an excellent tool for teachers who want to introduce different forms of poems to their pupils and features different types of puzzle poems that are commonly used as models for children's writing in schools. Including puzzle poems ranging from easy to difficult, different poem styles and lots of humour, join Roger Stevens as he helps young readers crack the codes and learn to write their own puzzling poems that will baffle even the greatest mind. Roger Stevens is a poet, author, musician and artist. He has more than twenty five books published and his poems have appeared in more than two hundred anthologies. Roger performs his poetry in schools, libraries and festivals and runs creative writing workshops for young and old. Roger founded the award-winning Poetry Zone website.